OMEGA Single Wing Standard Nut Plate Jigs were designed to facilitate accurate rivet hole drilling for standard Plate-Nuts. The terms Anchor-Nut, Plate-Nut, or Nut-Plate are frequently used interchangeably and refer to a group of fasteners consisting of a Threaded Nut Element which can be anchored to another structure. OMEGA Nut Plate Jigs are designed to exact tolerances and include drill bushings that reduce wear and consistent hole-spacing. 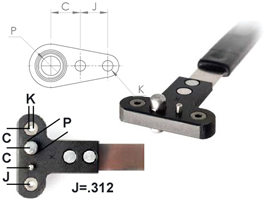 OMEGA Nut Plate Jigs also feature a spring-steel band between the handle and the head to allow for finger positioning of the tool in cramped areas. OMEGA Single Wing Standard Nut Plate Jig 4 Piece Set. The OMEGA NPJ518RX #40 Single Wing Standard Nut Plate Jig (SWS) is one of thousands of quality tooling products available from MRO Tools. Please browse Single Wing Standard Nut Plate Jigs (SWS) for tools similar to the OMEGA NPJ518RX #40 Single Wing Standard Nut Plate Jig (SWS). OMEGA NPJ518RX #40 Single Wing Standard Nut Plate Jig (SWS) description summary: OMEGA Single Wing Standard Nut Plate Jig (SWS). Nut Thread Reference: 1/4 (C)Hole Spacing: 0.500 (J)Hole Spacing: .312 (P)Pilot Diameter: 0.3105 (K)Drill Size: #40 Quantity discounts may be available for the OMEGA NPJ518RX #40 Single Wing Standard Nut Plate Jig (SWS). Please contact MRO Tools for details.